Fight week is upon us and questions abound as Floyd Mayweather and Conor McGregor finalize preparations. A quartet of media members provides some answers. Fight week is here. An event many thought would never happen is happening Saturday in Las Vegas when undefeated boxer Floyd Mayweather takes on mixed martial arts superstar Conor McGregor in a boxing match. Is it an actual sporting event? Is it a promotional gimmick that will make a lot of money for a handful of people? What exactly is happening with this fight and can a mixed martial artist actually hold his own in the boxing ring with one of the greatest fighters of all time? We’ll know soon enough. In the meantime, we assembled a panel of media members who cover boxing, MMA or both and tossed a few questions their way. How do you view Mayweather-McGregor: As a legitimate sporting event or a “for entertainment only/exhibition” type of thing? Helwani: As an entertaining sporting event. Whether we like it or not, this fight is being sanctioned by the Nevada Athletic Association. Does it defy the conventional rules of boxing matchmaking? Yes. But it's here, and if Mayweather wins he'll be 50-0 and if McGregor wins he'll have pulled off one of the greatest upsets in sports history. Stakes like that aren't attached to exhibitions. Iole: I hate to equivocate, but it's a little of both. Its freakish nature and the fighters' abilities to talk trash are what made this match in the first place. It's really the first bout of the social media era, made almost entirely through fan demand on social media. But they're among the greatest of all-time in their sports and are at the top of the heap now, so it is a legitimate sporting event, even if it's not the most fairly matched contest ever. ​Bishop: Short answer: both. What I don't view it as is a typical boxing match. It feels more like an exhibition, like when Ali fought a pro wrestler from Japan in 1976. That said, any time two athletes as talented as Mayweather and McGregor engage in combat inside a boxing ring, that should qualify it as a legitimate sporting event. I'd argue it's a legitimate sporting event exhibition. Dyce: I think it's hard to draw a distinction between the two. It is a legitimate sporting event that is being governed by an athletic commission and will impact the records of each fighter, but it is also for entertainment and an exhibition in the sense we won't likely see this cross over super fight again. It is really like the early UFC days, when it was still called no holds barred. Martial artists of different back grounds competing to see which discipline was superior, albeit this fight is narrowed down to a singular discipline. The perception of MMA legitimacy is on the line. Can McGregor's striking abilities make him a viable competitor against Floyd Mayweather, or is the discrepancy too wide of a gap? Most everything I’ve read points to an easy Mayweather victory. Do you agree? Do you see any way McGregor wins this fight? ​Helwani: On paper, Mayweather holds all the advantages. This is his world, and he's one of the greatest ever. However, this is what I keep telling people who ask me about this fight: Four short years ago, McGregor was collecting unemployment checks. Nothing he does make sense. When he was about to fight Jose Aldo, considered the greatest 145-pounder in MMA history, few believed he'd win, let alone in just 13 seconds. His rise is unlike anything I've ever seen in sports. The fact that we're about to watch this fight doesn't make sense. So why can't the fight that everyone thought was impossible to make end in the most impossible way? I've heard very smart people say McGregor won't land a punch. They may be right in the end, but I have too much respect for what he's accomplished to count him out. Make no mistake, he's up against it, but he has a knack for rising to the occasion when everyone is doubting him. Iole: I think Mayweather wins in a rout. If some of the finest boxers of the last 20 years couldn't do much with him, how could a guy who has never boxed? Conor is going to try, and he'll be physical, and that may have some slight impact on a 40-year-old Floyd. But this is a master versus a novice at the end of the day. Dyce: Conventional wisdom says Floyd Mayweather will win easily, but I think it might not meet the eye test for casual fans. That might skew the perception after the fight. I don't think Mayweather will knock out McGregor. Mayweather has only knocked out seven fighters after 1999, over 27 fights. He will fight defensively and it will be a decision, perhaps an even boring fight. The fact that it will go to a decision will be viewed as a victory for McGregor no matter how lopsided the judges' scorecards are. And if Mayweather fights defensively, as expected, he will be labeled as someone who ran from McGregor in an effort to prevent him from winning. This strategy will neutralize McGregor's one chance of winning, which is to draw Mayweather in and counter like McGregor did so successfully against Jose Aldo at UFC 194. Is there a way McGregor wins this fight? Yes. Are events like this good or bad for the sports involved? Helwani: How can they be bad? Events are fun. Big events are even more fun. We have enough things to worry about outside of sports to get all hot under the collar for something like this. As a journalist, I've enjoyed covering this very much. It's been different. Different is fun. Now, the final chapter in this story will be written on Aug. 26. If the fight ends up being a total dud, maybe I'll have a different take, but right now, I don't see how this is bad in any way, shape or form. The world is talking about boxing and MMA. For two sports who have often felt ignored, this is good. Iole: I have written this multiple times, and I don't think it impacts either boxing or MMA very much. This is a one-off event and I think the public recognizes that. ​Bishop: Stephen Espinoza, general manager of Showtime Boxing, told me that this bout should not be a referendum on either sport. I believe that if McGregor does win that will hurt boxing. I mean, to have someone come in for their first pro bout and beat the best defensive fighter of his generation, if not ever, that doesn't speak well for Mayweather's undefeated record or his reign as pound-for-pound king. The flip side of that is perhaps we're underestimating McGregor and his power and his boxing background (which isn't extensive but isn't as non-existent as it has been described). If Mayweather wins by decision as I think he will, they'll both bank a ton of money and everyone will move on with their lives. I don't think it hurts the UFC at all. Dyce: It's good for both sports. When the UFC was struggling to gain traction over a decade ago, the UFC used a reality television show called The Ultimate Fighter to draw in potential fans. The show aired immediately after WWE's Monday Night Raw and that crossover helped, in part, build the UFC fanbase. The crossover is an opportunity for both sports to tap into each other's markets. Boxing, perceived to be a dying sport, can tap into arguably the most popular combat sports audience to rebuild interest in their sport. Casual fans tuning in could become return customers for boxing. It is a potential life line as boxing brings about some legitimate fights, like Canelo Alvarez vs. Gennady Golovkin, and an intriguing new heavyweight champion in Anthony Joshua. For MMA, they can continue their march into the mainstream by introducing casual fans and boxing fans to their star fighter. If McGregor is competitive at all, boxing fans could view MMA as legitimate and embrace the sport and the UFC grows again. This could be this decade's iteration of the first season of The Ultimate Fighter, remembered as a pivotal moment in the sport's growth. Should Mayweather win, he’ll improve to 50-0. Where will he ultimately rank among boxing’s all-time greats? ​Helwani: I'll let the historians ultimately decide where he'll rank, but that record alone obviously puts him among the very best. I also think there's no arguing that he is among the very best defensive boxers of all time. 50-0 transcends boxing. In my opinion, it also puts him alongside the greatest athletes of all time. There's a solid chance we'll never see anyone beat that record. Personally speaking, as a 35-year-old who's been watching boxing for over 20 years, he's certainly the best of my generation. Iole: I have thought about this a lot in recent years and I think he belongs somewhere between 15 and 25. The Top 10 in my opinion is easy -- Sugar Ray Robinson, Henry Armstrong, Muhammad Ali, Joe Louis, Sugar Ray Leonard, Roberto Duran, Harry Greb, Jack Johnson, Sam Langford and Willie Pep -- but it's not so simple after that. Mayweather has won all of his fights and he's fought a slew of fighters who will end up in the Hall of Fame. If there is a criticism of him, it's that he didn't face his toughest opponents when they were at their peaks, and that pushes him down a bit on an elite list like this. And while he is an underrated offensive fighter, I think his offensive is a bit less than the men I perceive above him. Bishop: This one is tricky. I believe that Mayweather ranks among the most skilled matchmakers in boxing history. I believe there's some truth to this notion that he fought guys when they were too young or too old or at exactly the right time. That said, I also believe some of the criticism of Mayweather is unfair. He did fight several future Hall of Famers (Mosley, Miguel Cotto, Manny Pacquiao, etc.) and he did beat numerous world champions (17, I think). You don't luck your way into that kind of record, no matter who you pick to fight and when you fight them. So that's a long way of saying I think he belongs among the all-time greats but not near the top of the list with Muhammad Ali, Sugar Ray Robinson, Sugar Ray Leonard, Rocky Marciano, etc. 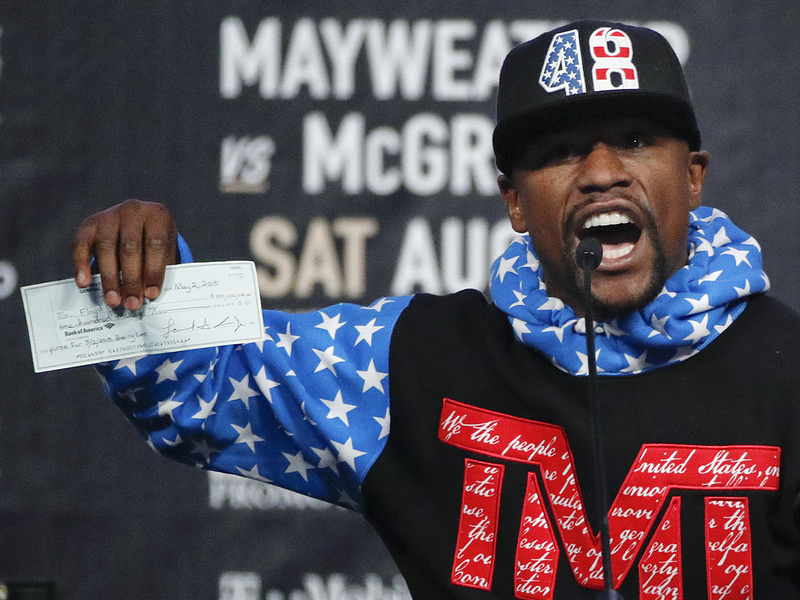 Dyce: Mayweather is already amongst the greatest of all time. A record of 50-0 would move him ahead of Rocky Marciano, even if you decided to attach an asterisk to it. Essentially it all comes down to what variables an individual considers when ranking the greatest of all time. If it's purely based on record, Mayweather would have a claim to the top spot. In the minds and hearts of others, he will never supplant Muhammad Ali or Sugar Ray Robinson. He definitely will be in the top 10. 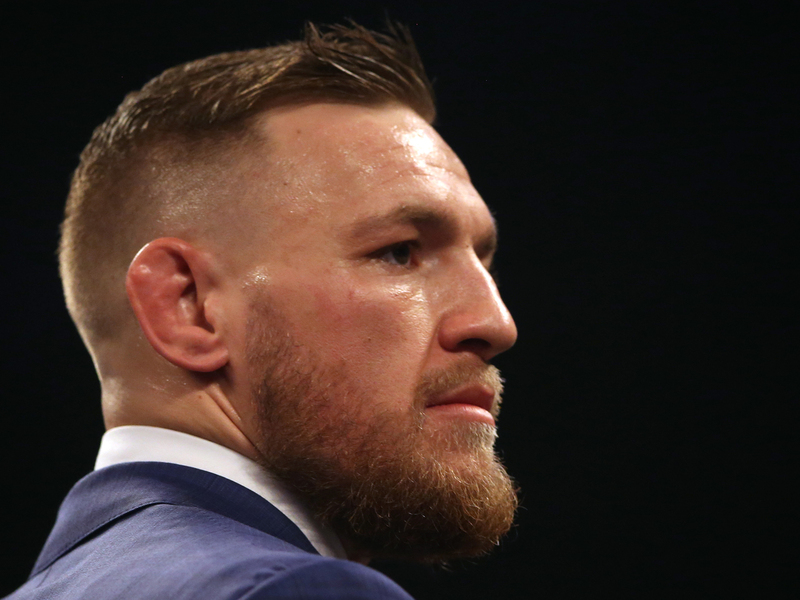 Will a loss impact McGregor’s status in the MMA community? Helwani: I don't think so. MMA fans are quick to forget losses. Witness the fact that McGregor lost to Nate Diaz in March 2016 and their rematch in August was one of the highest-selling pay-per-views ever. Perhaps more importantly for him, though, his popularity seemed to increase after the loss because of the way in which he handled it. Everyone knows what he's dealing with here, and I think a good portion of MMA fans are tolerating this venture but longing for him to return to MMA to defend his lightweight title against the best at 155. So unless he looks really bad out there, which I don't expect, I don't foresee his stock going down in MMA. At this point, it can only go up because this is all gravy for him. ​Iole: Would it hurt the reputations of Roger Federer or Pete Sampras as tennis players if they played in The Masters next year and failed to break 100? Of course not. And it's not going to impact Conor in the MMA game. When you talk as much as he does and you don't back it up, there is going to be taunting, etc, but I think MMA fans are shrewd enough to understand the differences between the sports and that if Floyd had fought him in an MMA bout, they'd be scraping Floyd off the canvas. Dyce: The MMA community has rallied around McGregor ahead of this fight, which is being billed as boxing vs. MMA. And the more important thing will be McGregor's impact on UFC fighter's future, win or loss. This is a man who got the UFC to allow him to fight outside the UFC for a huge sum of money, a fight where he was billed as a co-promoter. These are unprecedented feats that could have ramifications for fighters in the future as they try to negotiate and work toward a better financial future. And a rising tide lifts all boats. This fight is also drawing incredible attention to the UFC, something that could help the marketability of other fighters and revenue stream for the UFC in general, which would hopefully equate to pay increases for fighters. So before the fight even takes place, his impact has already begun to take shape.